Chemical peels are exfoliating treatments that lift off the top layer of the skin. We perform dozens of chemical peels every day. 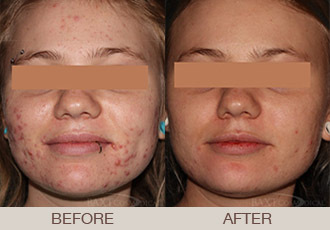 Chemical peels work to reduce acne, fine lines and wrinkles, and hyperpigmentation. At BAXT CosMedical®, we offer Glycolic Acid Peels which vary in strength, and TCA peels or Trichloroacetic Acid peels, also in different strengths. Our favorite chemical peels are glycolic acid and TCA. Our Glycolic acid peels are mild. Glycolic acid is derived from sugar cane. TCA is trichloroacetic acid, which is a stronger peel. Both peels itch and burn a bit on the skin and then the ice water feels great afterwards. Our board certified dermatologists will work with you to determine if chemical peels are right for you, and which chemical and strength is preferable. These are physician office strength peels, and not what you might see advertised in a salon or spa done by an esthetician. What Are The Benefits Of Glycolic Acid Peels And Trichloroacetic Acid Peels? These peels benefit patients who have acne, sun damaged and aging skin, hyperpigmentation and melasma. These peels are applied by our board certified dermatologists and then after a specific amount of time are neutralized. They slough off old skin cells thereby encouraging the regrowth of new cells at a more rapid rate. This encourages production of collagen to the skin, reduces pore size and helps to reduce fine lines and wrinkles as well as pigmentation and clogged pores. Depending on the strength of the chemical peel used, the patient will experience some superficial peeling which usually involves redness followed by flaking that usually lasts 3-5 days. How Do I Care For My Skin After The Chemical Peel? After a chemical peel, we often recommend just mild cleanser and light moisturizer and avoiding any irritating products. Best to avoid the sun and use sunblock. Peels are usually done on a monthly basis. Our board certified dermatologists have performed thousands of chemical peels and they can counsel you to determine if peels are the right choice for your skin. Peels done in salons are typically much weaker than the peels in our office, although we do have light peels if needed.